On the Email tab, and click Address Book. Enter a Distribution List Name. In the Available Contacts list, select the contacts you want to add, or click Select All. Click the chevron button > add a contact to the Selected Contacts list. To send email to your distribution group, add the distribution group to the To: field in your compose window. Click in the field, and start typing to see a list of available contacts and groups. Read more about composing messages in webmail. Note: To keep a distribution group private, add the distribution group in the BCC: field. 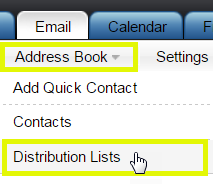 You can view your distribution group list in your address book. You aren't able to export the distribution list, itself, but you can export your address book.